Hello! One thing about running a small business with an employee of one, me, is that I have been learning ever so slowly how to incorporate more organizational systems to keep things moving. Sometimes its fun to come up with my own solutions, other times, why re-invent the wheel? 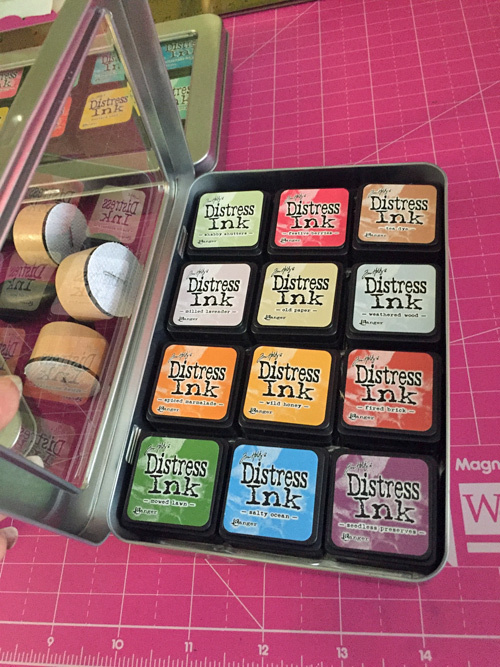 There are great storage solutions out there so I took the opportunity during one of those big online sales at Joanns and bought these cute storage tins that are made to hold the mini Distress Inks. The clear top is great to see quickly what colors I have and they stack nicely for storing. 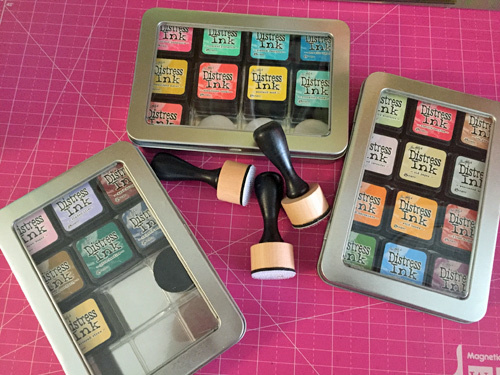 I switched a while back to use the round daubers with these ink pads and after searching online, I saw a great idea online where someone stored the pads right inside the ink case. So I put them right in the bottom of each ink pad so that I don’t have to worry about accidentally mixing colors. The fit in and stay put until I am ready to use them. 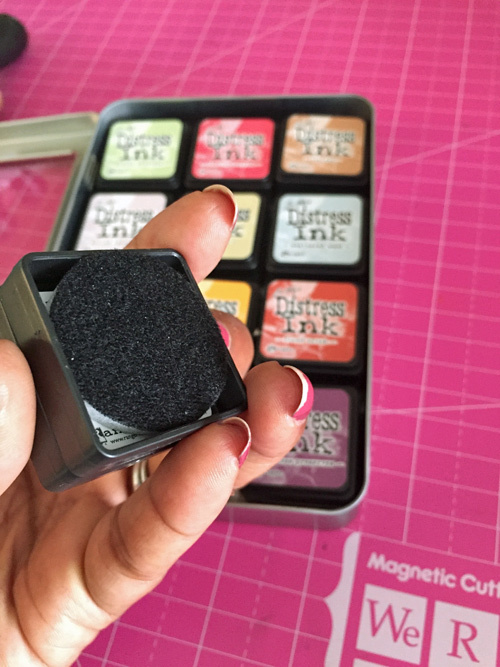 When I am ready to use them I just turn the ink upside down and press down lightly and the foam sticks to the velcro and off we go! One more look at the cases so you can get an idea how compact they are. I like these more than my larger ones because I can see everything at a glance more quickly but if I use a certain color more I may either buy a re-inker or just get the larger ink pad. For now, this works nicely. 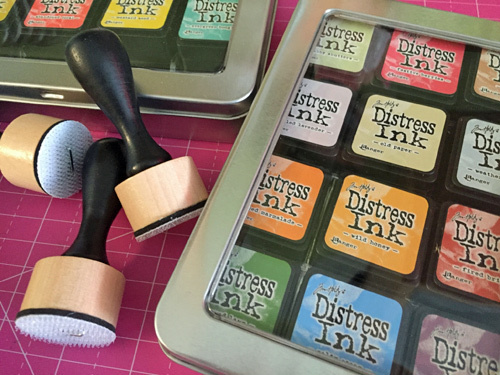 Hope you found an idea or inspiration to keep on organizing your craft supplies. Next PostHappy First Day of Fall!!! Great ideas! 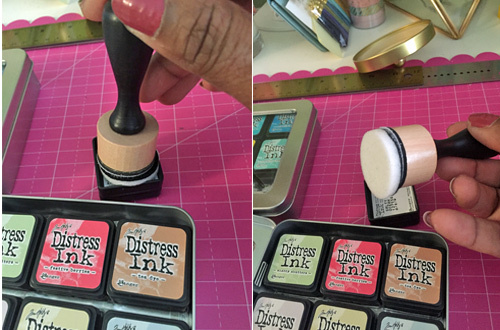 Love the mini ink pads and containers. I just may need to buy some of each now! They are great. Just wait for a sale and pick up a few cases. I like that don’t take up too much space. Especially since you know how I craft – everything out on the table! !